Mouse anti Pepsinogen-1 antibody, clone 8003 (99/12) used for the identification of pepsinogen-1 expressing tumor cells by immunohistochemistry on formalin fixed, paraffin embedded tissue sections. Differentiation of pyloric-gland type to fundic glands. 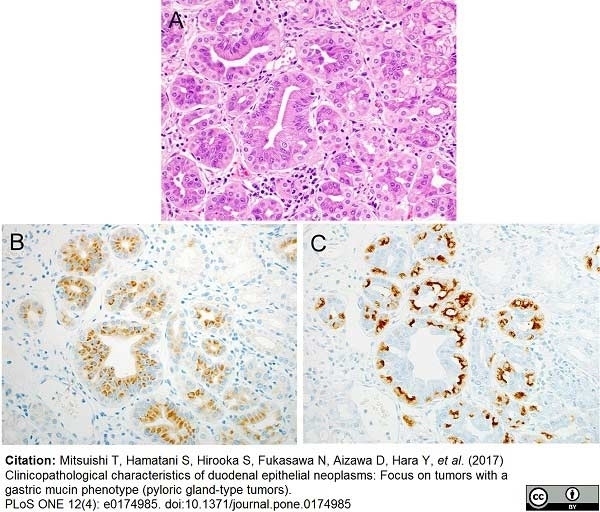 (A) HE-stained image, showing proliferation of atypical glands associated with mildly enlarged nuclei. (B) Differentiation into fundic glands (pepsinogen-1). Tumor glands are positive for pepsinogen-1. (C) Differentiation into fundic glands (H,K-ATPase). Similar to pepsinogen-1, H,K-ATPase-positive cells can be seen in tumor glands. Mouse anti Human pepsinogen 1 antibody, clone 8003 recognizes human Pepsinogen I, a zymogen or proenzyme secreted by chief cells in the stomach. It is cleaved to form pepsin both in an autocatalytic fashion and by pepsin itself. In humans there are two related forms of pepsin, Pepsinogen I (also known as pepsinogen A), and Pepsinogen II (also known as Pepsinogen B or progastricsin). Mouse anti Human pepsinogen 1 antibody, clone 8003 has an affinity of 4 x 1010 l/mol human Pepsinogen I. 1*This product requires antigen retrieval using heat treatment prior to staining of paraffin sections.Sodium citrate buffer pH 6.0 is recommended for this purpose. Ueyama, H. et al. (2010) Gastric adenocarcinoma of fundic gland type (chief cell predominant type): proposal for a new entity of gastric adenocarcinoma. Am J Surg Pathol. 34: 609-19. Genta, R.M. & Pusztaszeri, M. (2006) The gastric mucosa in gastric cancer patients in a low-incidence area. Eur J Gastroenterol Hepatol. 18 (10): 1085-93. Fujita, Y. et al. (2016) Incidence of lymphatic involvement in differentiated-type intramucosal gastric cancers as examined by endoscopic resection. Gastric Cancer. 19 (1): 192-7. Sakamoto, H. et al. (2011) Cell lineage dynamics in the process leading to intestinal metaplasia. Nakajima, T. et al. (2016) Distribution of Lgr5-positive cancer cells in intramucosal gastric signet-ring cell carcinoma. Pathol Int. 66 (9): 518-23. Mamat O et al. (2016) Fundic gland differentiation of oncocytic/pancreatobiliary subtypes of pancreatic intraductal papillary mucinous neoplasms. Mitsuishi, T. et al. (2017) Clinicopathological characteristics of duodenal epithelial neoplasms: Focus on tumors with a gastric mucin phenotype (pyloric gland-type tumors). PLoS One. 12 (4): e0174985. Chiba, T. et al. (2016) Clinicopathological features of gastric adenocarcinoma of the fundic gland (chief cell predominant type) by retrospective and prospective analyses of endoscopic findings. Dig Endosc. 28 (7): 722-30.